The Bundesliga is back from an uncharacteristically short winter break. The game between Bayer Leverkusen and Bayern München will kick off what promises to be a thrilling second half of the season. Here are five things to look out for in what Germans call the Rückrunde. At the halfway point of the season, there is only a four-point gap between Schalke, who are in a second spot and Eintracht Frankfurt, who are in the eighth spot. The teams in between – Borussia Dortmund, Bayer Leverkusen, RB Leipzig, Borussia Mönchengladbach and Hoffenheim – have a fair shot at securing Champions League qualification for next season. Hoffenheim, Gladbach, and Eintracht may settle for the Europa League spots but the rest will be fighting it out for a Champions League spot during the Rückrunde. The only way Dortmund can somehow salvage their season is by at least securing Champions League qualification, Schalke and Leverkusen are on a good form and will fancy their chances of a return to Europe’s prime competition, while Leipzig will want another taste of the tournament. The title race may already be over but the chasing pack has a lot to play for in the Rückrunde. As is the case with the chase for Champions League qualification the fight for survival looks to be going down the wire. There is only a four-point gap between Wolfsburg in 13th spot and Hamburg in 17th spot. Köln’s hope of staying in the Bundesliga looks gloomy as they are 11 points from safety. However, with 17 games still to go they can start their ascent up the league table when they host derby rivals Borussia Mönchengladbach on Sunday. Wolfsburg and Freiburg have both turned a corner after their poor start to the season. But there are huge questions surrounding Stuttgart, Mainz, Bremen, and Hamburg ahead of the Rückrunde. 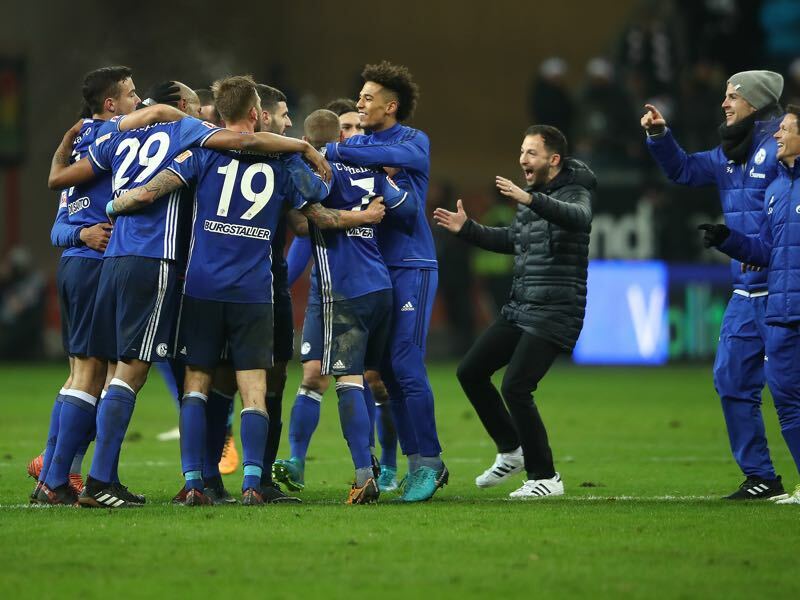 Under the guidance of their young and bright manager, Dominico Tedesco, Schalke are looking like their old self. The Royal Blues are currently second in the league standings and will look to remain competitive in the Rückrunde. Schalke contains a squad of veterans and young talents, who are all enjoying their best form. With their smart sporting director, Christian Heidel, adding further reinforcements to the squad they will be a force to be reckoned with. Just like Schalke, Leverkusen’s new managerial appointment is paying off. Die Werkself are currently fourth in the standings and well on their way to a Champions League return after a year absence. The side is currently on a 12 match unbeaten run and managed to score in every league game this season. Kevin Volland looks his old prolific self and Leon Bailey is running the show for Bayer. Marco Reus and Mario Götze who once graced the Bundesliga with their telepathic understanding on the pitch and close friendship off of it are on their way back in the New Year. The duo was involved in the training camp at Marbella. Their return will provide a timely boost for a Dortmund side short on creativity and it is also a good news for the German national team as the 2018 FIFA World Cup closes in. The second half of the Bundesliga promises a lot of excitement and the action starts at the Bay Arena on Friday. Will the Eagles Soar in Russia, or Will Serbia Sink at the World Cup?